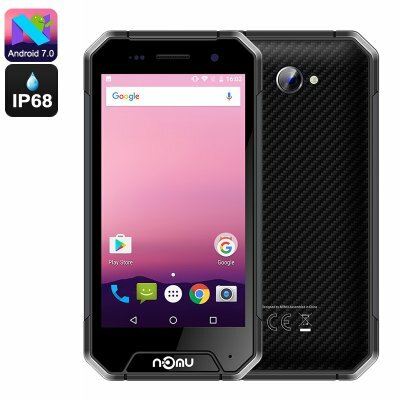 Successfully Added NOMU S30 Mini Android Phone - Android 7.0, Quad-Core CPU, 3GB RAM, HD Display, Dual-IMEI, 4G, IP68 Waterproof, 3000mAh (Grey) to your Shopping Cart. The NOMU S30 Mini is a compact rugged Android phone that, despite its fully rugged IP68 body, features an extremely sleek design. This waterproof smartphone is fully resistant to water, dust, and drops. Therefore, you won’t have to worry about carrying it along when heading out into the wild. If you’re often spending time outdoors or are working in a rough environment, the NOMU S30 Mini is the perfect Android phone for you. With its Dual-IMEI numbers and 4G support, this rugged smartphone keeps you connected anywhere you go. At home, work, or in the forest – with this rugged Android phone you’ll always stay within reach to friends and family. Packed within its waterproof body, this rugged smartphone hides some sophisticated hardware. With its Quad-Core processor and 3GB RAM, it allows you to enjoy demanding Apps, games, and movies. The cell phone itself comes with a 4.7-Inch display that treats you to crisp HD visuals. By featuring Corning Gorilla Glass 3, the screen of this Android smartphone is extremely durable and has been made to withstand a hit. Whether you’re indoors or out in nature, this Android phone will always keep you entertained. With its 8MP camera, the NOMU S30 lets you shoot beautiful photos and Full-HD video of all your upcoming outdoor adventures. The phone treats you to 32GB internal storage and 64GB SD card support. Therefore, you’ll never run out of space to store your pictures, video’s, files, and other media. Thanks to its 3000mAh battery, you can enjoy all this phone has to offer for up to 8 hours straight. The NOMU S30 Mini Android Phone comes with a 12 months warranty, brought to you by the leader in electronic devices as well as wholesale smartphones..